FactCheck: Are there really 8,500 social housing units currently being built? Part One of FactCheck’s two-part series on high-profile disputes over social housing, this week. THIS WEEK SAW two high-profile rows between the government and opposition over what’s being done to increase the provision of social housing in Ireland. On Thursday afternoon, Fianna Fáil’s Barry Cowen and Tánaiste Frances Fitzgerald clashed in the Dáil over the number of social housing units currently being built. And on Thursday’s Tonight With Vincent Browne, Sinn Féin’s Eoin O’Broin and Junior Minister Damien English accused each other of not telling the truth over the number of new social housing units provided last year. In a two-part series, TheJournal.ie‘s FactCheck responds to reader requests, and steps in to resolve both disputes and find the truth of the matter. Tonight, we’ll deal with Cowen and Fitzgerald’s row in the Dáil, and on Tuesday, we’ll referee O’Broin and English’s on-air argument. Barry Cowen: On Tuesday, for example, the Taoiseach was here and he waxed lyrically about the fact that there was over 8,500 [social housing] units presently under construction. And I…lost my head in trying to point out to him that that wasn’t at all true. (Emphasis added). Frances Fitzgerald: There are 8,500 social housing units being built across the country at the moment. In response to our request for evidence, Fianna Fáil cited figures contained in the Department of Housing’s most recent Social Housing Construction Status Report, which was published on Monday. FactCheck did not receive a response from the Department of Justice, or Fine Gael, on behalf of Frances Fitzgerald. So as you can see, the Tánaiste was mistaken in her claim that “there are 8,500 social housing units being built across the country at the moment”. There are 8,430 at some stage of development, but only 1,829 are actually being built at the moment. It should also be noted that 2,687 of those 8,430 (32%) are at the capital appraisal stage, which means they may or may not even be approved for funding and construction. Barry Cowen was therefore right to say it was untrue that ”there was over 8,500 units presently under construction”. But it’s worth noting that in the Dáil on Tuesday, the Taoiseach made contradictory statements on this issue. At first, Kenny offered a breakdown of the 8,430, accurately listing the number of units for each stage of development, and correctly stating that 1,829 units were currently under construction. That means blocks, concrete, block-layers, plasterers, chippies, site works – 8,430. As we’ve shown, this is false. That description only applies to 1,829 of the 8,430 units at some stage of development, some 22%. 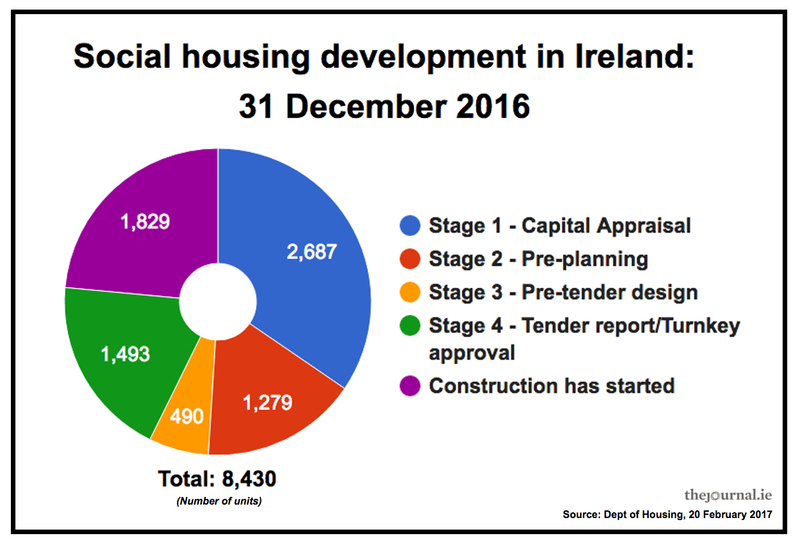 Frances Fitzgerald’s claim was that “There are 8,500 social housing units being built across the country at the moment”. We rate this claim FALSE. As our verdicts guide explains, this means “The claim is inaccurate”. This is the third time we’ve fact-checked a claim by Frances Fitzgerald. She has now received verdicts of TRUE, Half-TRUE and FALSE. You can read her FactCheck file here. Email “FactCheck: Are there really 8,500 social housing units currently being built?”. Feedback on “FactCheck: Are there really 8,500 social housing units currently being built?”.